Apple's got Siri. Amazon's got Alexa. Microsoft's got Cortana. What do they have in common? As of today, they all begin their descent toward irrelevance, as we boldly announce the launch the next big thing in voice recognition. We are thrilled to present your newest friend in the AI business, BonanzaVoice! 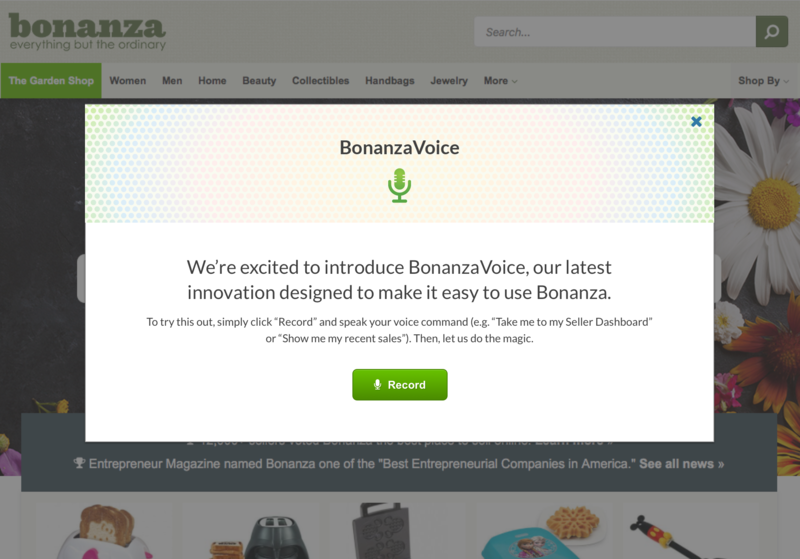 Now, you can use voice technology to search for items on Bonanza, navigate to help articles, pay your bill, send feedback to Bonanza, or dictate messages to other users. BonanzaVoice is accessible for logged in users via the banner at the top of any page. Simply say what you'd like to do and see instant results. To some, it may seem a perplexing question: what does Bonanza have to prove in the voice recognition space, given the recent strides of our better-funded rivals? I'm sorry, I didn't quite catch that. Could you repeat the question? Sound familiar? Then you know the answer. BonanzaVoice differentiates by focusing on what we call PerfectMatchtm Accuracy as a starting point. When you're conversing with your computer, you don't have time to waste having your queries repeated back to you, or worse, not understood by some inept listening algorithm. Our engineers have leveraged lessons learned building the Background Burner and the best tool to measure lines of code. Over a nine month period, our engineers have crafted and polished PerfectMatchtm to be the perfect fit for your next purchase. Amazon's ambitions to get Alexa snooping listening to every conversation in your home are no secret. As their business people have recognized, this is their Trojan Horse to make shopping at Amazon as simple as forming a sentence. But what if a voice assistant could be more than a glorified timer and shopping basket? What if it could actually make your life easier? BonanzaVoice will not do that, but it will optimize your inquiry using PerfectMatchtm to reduce bandwidth used transmitting your question to the voice interpretation backend. For our initial implementation, we have built a full suite of voice recognition commands into the web browser, so you don't have to worry about the privacy of your conversations being accessed by advertisers or other third parties. We believe that BonanzaVoice will become your favorite new way to automate your Bonanza experience. Our hope is that by end of 2019 we will be able to completely remove slow text-based searching in favor of this improved user experience. Please leave us feedback about what you think of BonanzaVoice. We'll use this feedback to make improvements and adjustments as needed.